Report by TCFPA President Todd "PinTed" Andersen. The last planned TCFPA pinball event aptly was the 2005 Year-End Tournaments. 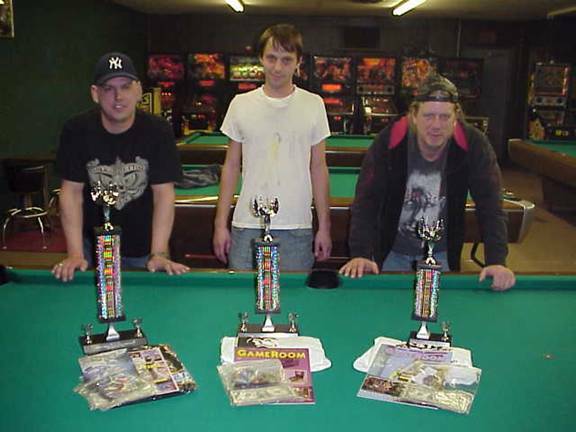 Two tournaments were held at a location Pinball News has a report on, SS Billiards in Hopkins, MN, USA. 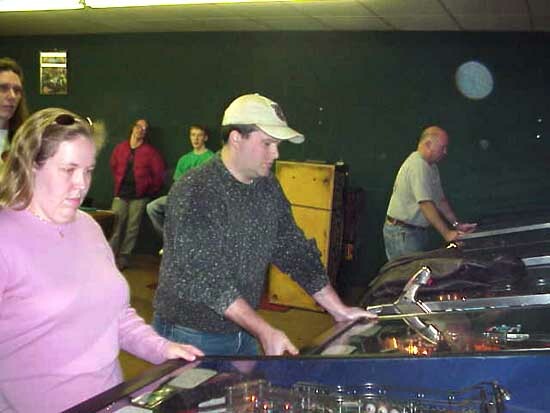 The first year-end pinball tournaments for the TCFPA were in 2003 . But, we just couldn't keep up the league. Unlike last year, no attempts were made to procure a “guest” pinball machine for a special pinball tournament. This proved a wise move by the TCFPA. Let us start with heart felt thanks to everyone who has helped the TCFPA. For, this last event simply couldn't have happened without our members and sponsors. 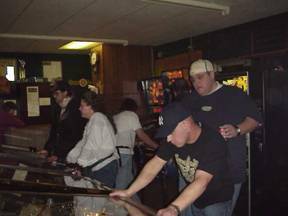 First off, thank you LTG of SS Billiards for providing a great place to play twenty-some well maintained pinball machines. 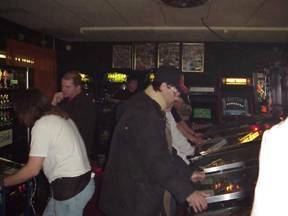 Besides providing the only location in the entire Twin Cities Region, Minnesota, USA for weekly pinball league play and twice yearly pinball tournaments. For this event, Lloyd also donated some “Safe Cracker” tokens and translights. And, we would especially like to thank the handful of members who showed up more Saturdays than not. It was for them the TCFPA was created. Thank you Pinball Renaissance for providing: the trophies for the double elimination tournament and for sponsoring some advances on the double elimination bracket. Thanks for also providing “Safe Cracker” tokens, and some of the give-away plastics. Thank you Kevin of K & K Amusement and Pinball at the Zoo for T-shirts and some of the plastics. Thanks to those who previously sold things to or donated to the TCFPA . And finally, thank you Pinball News for hosting this final write-up and for providing the cool T-shirt for the first place winner. Two pinball tournaments were planned for this event. The first would have been on Lloyd's three machines with ToPS headers. The tournament would be a one-day ToPS tournament on: “NASCAR”, “Elvis”, and “The Lord of the Rings”. The registration must have been priced too high, because no one paid the five-dollar registration fee on any of the games. Though one gentleman played normal “fifty cents for three ball play” and kept making attempts for about half an hour. It was only then that he came to the tournament director's table wanting his score registered. His entry was flatly declined. The second but successful tournament was the double elimination tournament. The TCFPA had very little funds for prize money. So, the original thought of only one winner was changed. It was decided that the remaining league funds would best be used to purchase three trophies; therefore having three winners. We still wanted a cash jackpot for each of the winners, so the contestants themselves, instead of the TCFPA, had to fund this event. Price for registration was $5.00 to enter and $5.00 for each advance on the double elimination bracket. So, the farther you advanced in the competition the greater the prize pool. Those who did not advance kept their investment low, but still supported the group. 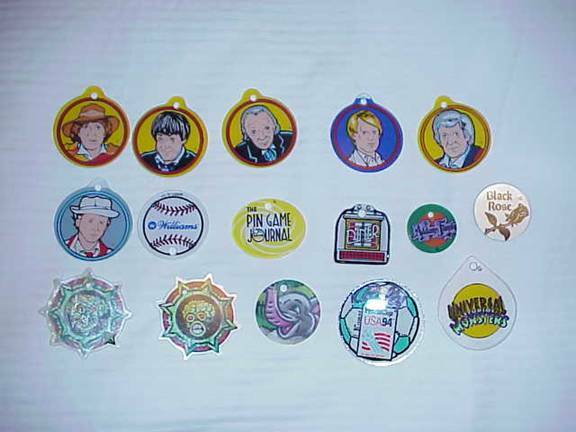 Everyone who registered for the Double Elimination tournament received one of over a dozen miscellaneous small promotional plastics: one of six doctors from “Dr Who”, WMS “SlugFest”, “PGJ”, “Diner”, “The Addams Family” small round, “Black Rose”, one of two Martians from “Attack from Mars”, the elephant from “Roller Coaster Tycoon”, small “World Cup Soccer”, or “Universal Monsters Teardrop”. Everyone who registered got choice of one from these little plastics. 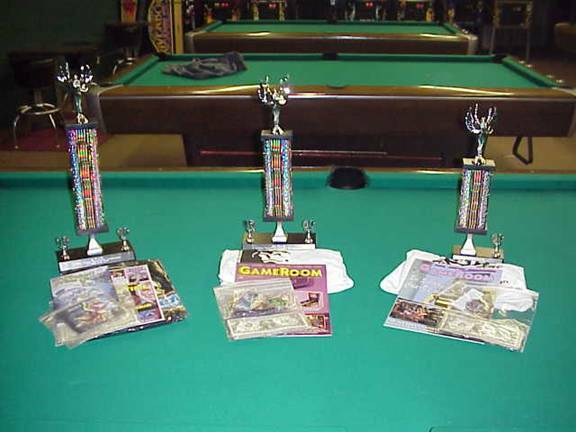 The first fifteen people who registered for the Double Elimination tournament received either a copy of “Pin Game Journal” or “GameRoom” magazine stuffed with a “The Machine - Bride of Pin*Bot” plastic and over a half-dozen different flyers: “Terminator 3: Rise of the Machines”, “The Simpsons Pinball Party”, “Elvis”, “The Lord of the Rings”, “Twister”, “Viper Night Drivin'”, “Black Rose”, and “Ripley's Believe it or Not”. The first sixteen people who registered got one of these packages. 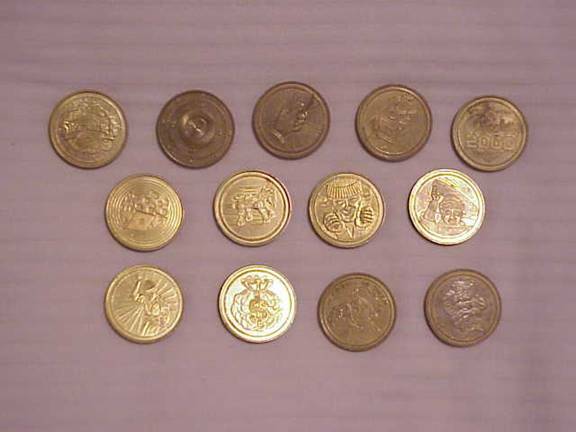 All nineteen people who registered for the Double Elimination tournament also received one of over a dozen different “Safe Cracker” tokens: Safecracker, Dial, Hand Holding Money, Bob's Getaway Rental, Candy 2000, Dice, Security Dog, Thief with Money, Helper Thief, Thief on Drop Line, Bag of Money, Guard Eating Doughnut, and Guard Sleeping. All nineteen people who registered got one of these “Safe Cracker” coins. 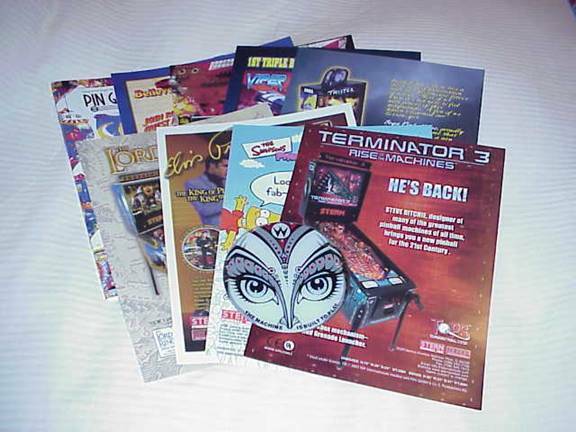 Besides the promotional pinball plastic everyone who registered for the double elimination tournament received, many other pin-promos were given out during this event. Just some of the giveaways included “I Love Pinball” and “ TCFPA ” bumper stickers, three-piece plastic sets – “The Addams Family”, “World Cup Soccer”, two-piece plastics sets – “The Addams Family”, “Twilight Zone”, “Popeye Saves the Earth”, “The Getaway: High Speed II”, and other pin-plastics. For example, a seven-piece plastic/sticker set, with all different plastics for “Pin Game Journal” was also given away. And, all of the TCFPA's last “Apollo 13”, “Guns N' Roses”, and “Maverick” translights were randomly awarded to those who registered. The first person to register was Tina Curtis. 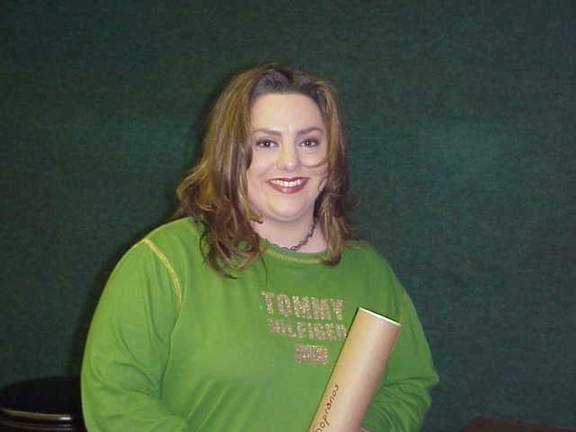 Tina was awarded for her early efforts by winning the translight for “The Sopranos”. During on one the random drawings, Tina also won a “Maverick” translight. Tina Curtis with her Sopranos translight. John Ross winning a two-piece plastic set for WMS “ Dracula ”. For the tournament, everyone who registered had previously drawn their own numbered chip. So each person was assigned a number. Each person was placed, by their randomly drawn number, 1 position on a 24–place double elimination bracket. A “bye” was placed on the five open brackets on the bracket. The person nearest the top of the bracket threw three six-sided die to determine the three games for “best-two-of-three” competition. As the dice were thrown, the randomly determined number was matched up on the ordered list of Lloyd's non-ToPS pinball machines. When a six-sided die is thrown, there is a one-in-six chance that the die will land on any side. This chance is the same each time this die is thrown. When the numbers from each of the die used in the double elimination tournament were added up, a roll of three six-sided die could produce any number from three to eighteen. As there were sixteen pinball machines that would be played, this worked perfectly for the purpose of randomly choosing games. As the numbers one and two could not be thrown, a seventeen would be used for the number one game and an eighteen would be used for the number two game. The other numbers, three through sixteen would represent that game number. This was the plan, but a few of the competitors incorrectly believed that because three dice were being used, the chances of throwing smaller numbers was less than that of throwing larger numbers. So, the crowd agreed to use the first duplicate number throw as the number one game and the second duplicate number throw as the number two game. The competition was very heavy at first. A packed house at Lloyd's. After the first two rounds competition got down to two groups, the lucky and the serious competitors. Luck or skill, the competitors started to thin out. Though bad luck put T.S.C. in the loser's bracket, he got up to the “Wizard Mode” on many of the games he played. waiting for match results during later rounds. To summarize the double elimination tournament, Nick F and Terry W were undefeated for most of the tournament. T.S.C. fell back early but fought back all the way to the winners circle. Because of their mutual “no-loss” status, Nick F and Terry W had to have a final round of competition to decide the winner. It looked like there would be a finish similar to that of two years ago. For the final results, look at the double elimination bracket (383KB Word document) or just read ahead. Line of partial prizes for the winners. And a “Ruling the Universe” T-shirt from “Pinball News”. And a 2003 “Pinball at the Zoo” T-shirt from “ Pinball Direct”. And, a “Classic Arcade” T-shirt from “Pinball Direct”. 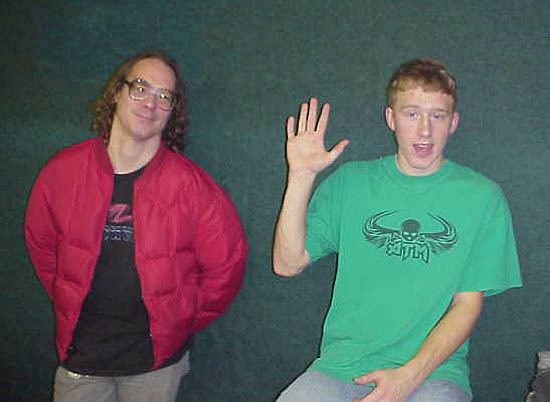 The wall of winners: Terry, Nick, and Terry. Rather than ending the night with a review of the day's events, Lloyd helped end the TCFPA events by presenting the TCFPA president with a plaque. 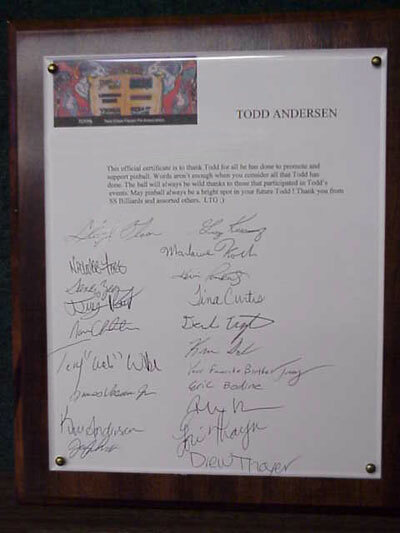 The plaque had been sighed by most of the TCFPA'ers in attendance on the final day. LTG has every plan to keep SS Billiards a family run business for another thirty years. In fact, Lloyd plans to have weekly pinball events on Saturday nights to fill the space left by the disbanding of the TCFPA. Please see Lloyd's website (SS Billiards) for details. And, starting next year, Lloyd has made allowances for Pinball Renaissance to hold monthly “Last Man Standing Pinball Competitions”. Please see RGP or the Pin-Ren website for details. Thanks to everyone who helped the TCFPA end successfully. All pictures courtesy of Lloyd / SS Billiards.